None of these films is a masterpiece, nor are they in the best shape after almost a century of neglect. Nevertheless, they're extraordinary time capsules of a more liberal era. In the early part of the last century, "vice" films, as they were often referred were common. These tended to be morality plays, but strikingly different in tone than we've come to expect. Buoyed by a Library of Congress restoration on the title film, this disc includes three extremely rare features from the very early days of motion pictures. The main feature, 1916�s The Devil�s Needle, stars one of the silent era�s biggest, if largely forgotten, stars. Norma Talmadge plays Rene, a young artist�s model whose unrequited love for a painter leads her down a rather unfortunate road. She takes to a life of drugs before dragging her painter friend down with her. There�s a largely irrelevant side-plot regarding the painter�s marriage to a well-regarded society girl who had also been wooed by a young gentleman, but this is largely to expand the cast of characters so that Rene�s drug addiction can impact as many lives as possible. 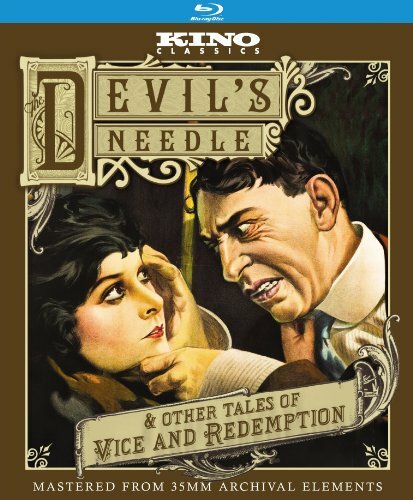 Despite it�s early vintage, Devil�s Needle is actually the most recent of the three films on the disc, coming during the very brief hey-day of the Triangle Film Corporation, a prestige company that gathered some of Hollywood�s biggest producers to make big, important pictures. They were sold off within three years. Inside of the White Slave Traffic from 1913, deals with forced prostitution, and, as such, was unsurprisingly popular and shocking upon its initial release. It�s not visually graphic, but pulls no punches otherwise in the story of a young, na�ve woman lured from her family by a charming letch whose only goal is to wheedle her into a life of prostitution. This one doesn�t exist in quite it�s full form, so linking narration fills in some narrative gaps. It plays very much like a docudrama, including a helpful inter-title glossary of 19-teens slang terms used by pimps that arrives on-screen at key moments. The story meanders and then leaps ahead in fits and starts, such that it can be trying to follow. Some of this is the result of the missing footage, though the narrative attempts to shoe-horn information don�t help. The film is dreadfully earnest, but also remarkably plausible. The young girl is cut off from her family, and shuffled from city to city such that she lacks any resources or connections with which to reclaim her freedom. She�s strong-willed, but without skills or anyone willing to help, she eventually finds herself back in the only life that will allow her to eat. It�s a story that hasn�t changed that much in its broad strokes in much of the world. Children of Eve, from 1915, takes on city living, with a bit more heavy-handed message than the first two films. Mamie (played by another silent-ear star, Viola Davis) is a child of the slums who struggles against her decadent, boozing lifestyle. The spectacular finale finds Mamie trapped undercover in a cannery factory full of children, representing all of the cruel and ugly practices of the time. Deliberately reminiscent of the Triangle Shirtwaist Factory fire of just a few years prior, director John H. Collins staged an elaborate factory fire for the finish, literally burning down a building to get the needed footage. The conditions of these films vary, although Kino presents them in what appears to me to be the best possible way. The Library of Congress performed an extensive restoration on The Devil�s Needle, but the results are more a matter of salvage than anything else. It�s thankfully watchable, but there�s the fading, bubbling, and strobing that are the unavoidable result of nitrate gone to the bad. There are moments, though, and more than a few, where there is great contrast and tremendous detail, in spite of all of the damage. This will be no one�s presentation piece, but I�m always thrilled when fine details come through on early film work, as they do now and again here. The other two films come in better condition, even without the extensive restoration work that went into The Devil�s Needle. Children of Eve looks the best, overall, while Inside the White Slave Trade is fairly muddy throughout, but lacks much major damage. Again, the problems here have little to do with transfer and everything to do with the quality of the surviving film, so Kino can�t be faulted. For such early work, it�s remarkable that effort has been taken to present them in the best possible light. As for audio, newly recorded scores for each film are presented as lossless PCM soundtracks, and they�re all pretty great. Era- and film-appropriate, each score is clear and detailed. As for extras, there are nine minutes of Outtakes from Children of Eve, essentially providing an extended version of the elaborate factory fire scene; and 20 minutes of largely inessential Raw Footage from Inside of the White Slave Traffic, which just provides a slightly different cut. These time capsules are preachy and frequently stagy, but also provide unique perspectives on the social issues and concerns of their times. More than that, they reveal that our concerns haven�t really changed all that much. The stories are prosaic, and the resolutions somewhat pat, but all three films are enjoyable nonetheless. As much as that, they�re interesting when compared to later morals films, especially those of the post-Hays code era. Whereas those films (often, even to the present day) were more temperamentally vindictive. Comparing the The Devil�s Needle to later films, the Norma Talmadge character would have typically been treated exclusively as a drug-addled home-wrecker, and the moral of the story would have been written into her downfall. The Hays code, with its prohibition on treating criminal behavior as in any way positive, would have all but mandated a terrible end, or at best a tragic sacrifice. Instead, Rene is treated humanely�a victim of circumstance and society, and even allowed a happy ending after kicking the habit (our other heroines don�t get as happy endings, but at least their finales have sympathy). The vindictive style of moralizing became so much a part of the DNA of Hollywood filmmaking that it�s refreshing to see so early a film wearing its heart on its sleeve, and allowing that a drug fiend could be played by one of the early motion picture world�s great idols. In the secondary films, the general feel is the same: the downfalls of the leads aren�t presented as a result of female wickedness or some inherent fault, but instead draw clear lines between breakdowns in family and society that destroy the innocent. In Inside the White Slave Traffic, a father turns his back on his daughter due to a single sexual indiscretion, an act that ultimately leads to her destruction. With Children of Eve, it�s the heartless factory owners that destroy youth in their greed. These are extraordinarily liberal tales, from a more liberal era that wasn�t as much concerned with individual blame or wickedness as it was with root causes. The boxed-set here is aptly named, since movie sinners would have very few opportunities for redemption in the decades to come.